Nissan South Africa and BMW have confirmed that they will collaborate to advance electric vehicle (EV) and plug-in hybrid vehicle (PHEV) adoption in South Africa. “Our introduction of the 100% electric Nissan LEAF in 2013 was part of Nissan’s global drive to advance sustainable mobility and to grow the market for zero-emission vehicles. With this in mind we believe our partnership with BMW SA is a sound investment to create a future-proof automobile industry,” says Mike Whitfield, Managing Director of Nissan South Africa. The agreement will see BMW SA and NSA roll out direct current (DC) fast-charging stations that are equipped with both the Combined Charging System 2 (CCS2) used by BMW’s electric and plug-in hybrid models and the Charge de Move system (CHAdeMO) plug standards used by Nissan’s 100% electric LEAF. The national grid of charging stations will also make use of smaller alternating current (AC) type vehicle chargers in certain regions. As part of the newly signed agreement, these chargers will be equipped with 'Type 2' sockets that allow the connection of all EVs and PHEVs. 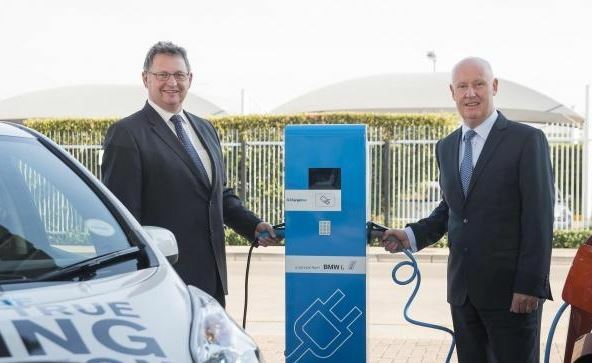 Planning and building a national electric vehicle charging infrastructure are major feats, and the grid will be managed by a joint task team comprising executives from both manufacturers. “By sharing expertise, ideas and challenges BMW and Nissan will accelerate the growth and consumer acceptance of the EV and PHEV market to the benefit of the entire automotive industry. These organisations have shown the same insight in establishing a vehicle charging grid as they did in creating their futuristic electric vehicles,” says Mike Schüssler, chief economist of Economist.co.za and an automotive market specialist. BMW SA introduced its EV and PHEV models, the BMW i3 and the BMW i8 in March this year. Both models have received global recognition for their innovative technology and low carbon emissions. In 2014 the BMW i3 was named the Green Car of the Year by the Green Car Journal, and the BMW i8 in turn was named the 2015 World Green Car of the Year. Nissan started the zero emissions movement in 2010 when it introduced the LEAF as the world’s first mass-produced EV. Its innovative design, modern battery technology and role in creating a market for 100% electric vehicles were recognised when it was named World Car of the Year in 2011. The LEAF was introduced in South Africa in 2013 and to date over 174 000 units of the pure-electric LEAF has been sold worldwide. The agreement between BMW SA and NSA is effective immediately and will run until 2017.